This cotton T-shirt is is sure to bring happiness to your child's face. Remember kids love Bullets too. This cotton t-Shirt feels great and is true to size. 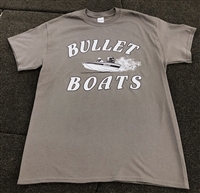 It features the Bullet Logo and boat graphic in white with a crisp black outline across the chest on a charcoal gray shirt. Available in Medium - 3xl. Pre-washed T Shirt with graphic design/logo on front only. Choose color and size below. T-Shirt "Catching Bass Since 1980"
Original "Catchin Bass" Bullet T Shirt with graphic design/logo on front and back. Choose size and color below. 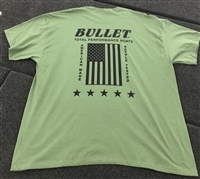 This Bullet Shirt proudly boast the American flag on the back with the Bullet Logo on the front and back. We proudly support our country, our flag, and our Military soldiers and Veterans. We take pride knowing that our boats are 100% hand made in the United States. This shirt features the Bullet logo on the front and back done in a true patriotic American flag design. We are proud to say our boats are 100% hand laid in the USA. Available in white and sport gray. 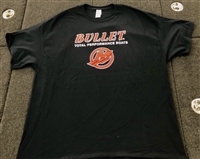 This awesome Bullet Logo shirt is a Pre-washed T Shirt with graphic design/logo on front and back. Available in Charcoal, Aqua, and Orange. Classic original T-shirt with Bullet logo on front and back. Colors and sizes vary, please select below. This black short sleeve T-shirt is 100% cotton and features the Bullet and Mercury logo on the chest in Red with a White outline. This is the shirt that let's everyone know you have been to the factory and seen how these works of art are made! Charcoal with Red and Black lettering.